I’ve never actually eaten one, so this was very useful. Have you ever read The Song of Solomon in the Old Testament? Its chock full of ’em. Actually, don’t read it because it’ll make you hungry. Pingback: Is There Any Performer 5 Side Effects | Виагра или Stamina Rx за ерекция? 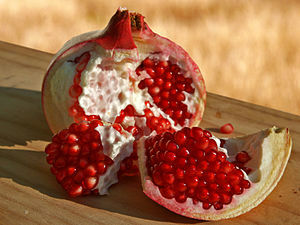 Your way of eating a pomegranate sounds almost like ritualistic hedonism! The way I learned to extract the berries is much more violent, but has the benefit of immediate stress reduction regardless of whether or not I eat the fruit. Which I always do, of course. I just ate one 4 the first time, got it from a grocery, they gave it 2 me in a paper bag , I had just paid 2.99 4 it so I cut it across with a plastic knife 2 get into it as fast as I could , and the little red things taste like cranberry but sweet no bitter, the sections pull apart easy. I wonder how they get them in California – the trees that is, I have found lemon trees on properties here in Florida but no pomegranate. Interesting. Great tip, the first time I saw this very simple process was when relatives from Italy came to stay.. one of my favorite fruits. Awesome tip, the first occasion when I saw this extremely straightforward process was when relatives from Italy came to remain.. one of my most loved organic products.